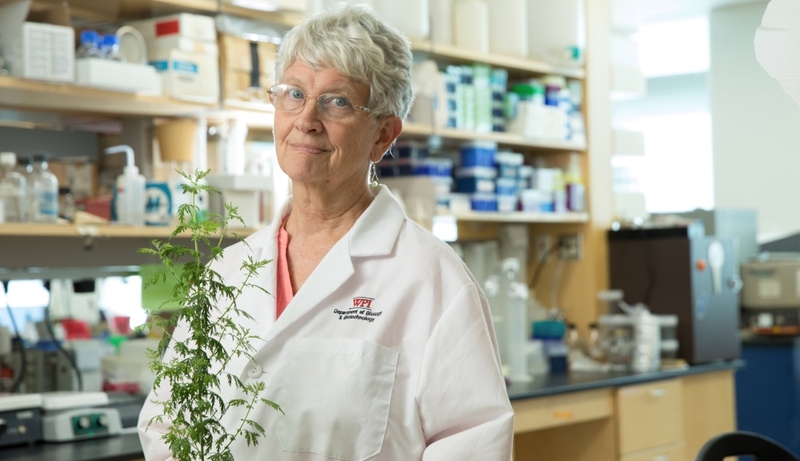 WPI biologist Pamela Weathers with the plant Artemisia annua, or sweet wormwood, which performed better that the frontline drug against the tropical disease schistosomiases in a clinical trial she helped run in Africa. The authors of the multinational study conducted in the Democratic Republic of Congo recommend implementation on a global scale to treat a disease that kills 200,000 people each year. Tea infusions made from two species of the wormwood plant cured the tropical disease schistosomiasis significantly faster than the drug most commonly used against the ailment—and with no adverse side effects—in a large clinical trial conducted in the Democratic Republic of Congo. The study’s authors, including a professor and two research associates at Worcester Polytechnic Institute (WPI), say the treatment should be considered for implementation on a global scale. Schistosomiasis, which is caused by parasitic flatworms, affects nearly 210 million people worldwide, primarily in Africa, Asia, and South America, and is responsible for about 200,000 deaths each year, according to the World Health Organization. Infecting the intestines and urinary tract, it causes a range of symptoms, including abdominal pain and diarrhea, and in more severe case can lead to liver damage, kidney failure, and even bladder cancer. The only cost-effective treatment is praziquantel, or PZQ, a drug used to treat a number of parasitic worm infections. Previous clinical trials have shown that the effectiveness of PZQ is enhanced when it is administered along with one of three anti-malarial drugs: artemisinin, artesunate, or artemether. Artemisinin is a chemical derived from the sweet wormwood plant, Artemisia annua, while the other two are chemically synthesized from artemisinin. While artesunate alone was found to be less effective than PZQ at eliminating the disease in the same trial, anecdotal reports suggest that a tea made from the Artemisia annua plant has been used successfully as a treatment for schistosomiasis. In the study conducted by researchers in Africa, Europe, and the United States* and published in the journal Phytomedicine (“Effect of Artemisia annua and Artemisia afra tea infusions on schistosomiasis in a large clinical trial,” December 2018), 800 patients from Maniema Province in the Democratic Republic of Congo (DRC) who exhibited signs of schistosomiasis infection were assigned to one of three groups. One group was treated with PZQ, while patients in the other two drank about a third of a liter of a tea infusion made from the dried leaves and twigs of either Artemisia annua or Artemisia afra (another member of the wormwood genus) three times daily. Patients were considered cured when no more parasite eggs were found in their stool samples. The results showed that both of the Artemisia tea infusions were just as effective in eliminating the parasite as PZQ, but that they achieved that result in two-thirds of the time—14 days, vs. 21 days for PZQ. And while many of the patients receiving PZQ suffered adverse side effects (more than 18 percent experienced abdominal pain, for example, and more than 26 percent had headaches), no side effects were reported among those who consumed the teas. Artemisia annua is categorized as a “generally recognized as safe” (GRAS) medicinal herb by the U.S. Food and Drug Administration, which means it is safe to add to foods and can be consumed without adverse effects. Made into a tea, the plant has been consumed as a remedy for malaria for hundreds of years in Asia, though it was not until 1972 that Chinese scientist Tu Youyou isolated artemisinin from the plant and demonstrated its effectiveness against malaria, a discovery that won her the 2015 Nobel Prize in Medicine. In her research, Weathers has compared the effectiveness of administering the dried leaves of Artemisia annua, ground up and made into tablets or capsules, to that of the standard malarial treatment, artemisinin combination therapy, or ACT, in which artemisinin is combined with one or more other anti-malarial drugs. In animal trials, her team has shown that the body more readily absorbs artemisinin from the plant than from the drug, that the plant-based therapy is more effective in eliminating the malaria parasite, and that the plant-based therapy may avoid the problem of drug resistance.Weathers believes that these differences between ACT and DLA are due to the presence of the other phytochemicals with medicinal properties in DLA. Weathers noted that Artemisia’s utility as a medicine goes beyond its demonstrated effectiveness as a treatment for schistosomiases and malaria. She said many species of wormwood, including Artemisia annua and Artemisia afra, grow naturally in areas of the world where tropical diseases are rampant and that the processes of growing, harvesting, and processing the plant and producing the DLA capsules or tablets can be done locally and even become the basis for local businesses, which could significantly lower the cost of treating these diseases and increase the availability of effective treatments. *The full list of authors of the Phytomedicine paper: Jérôme Munyangi, Université de Kolwesi/Lualaba, DRC; Lucile Cornet Vernet of La Maison de l'Artemisia, France; Michel Idumbo, Centre de Santé de Lubile, Maniema, DRC; Pierre Lutgen, Association IVFB-BELHERB, Luxembourg; Christian Perronne, Paris IDF Ouest, France; Dieudonné Mumba, Bavon Mupenda, and Nadège Ngombe, Université de Kinshasa, DRC; Jacques Bianga, Programme National Lutte Contre le Paludisme, Maniema, DRC; Paula Lalukala, provincial minister, Santé Publique Maniema, DRC; Guy Mergeai, Université de Liège, Belgium; and Chen Lu, Melissa Towler, and Pamela Weathers, WPI. Subscribe to WPI's research e-newsletter, WPI Research, published monthly during the academic year.